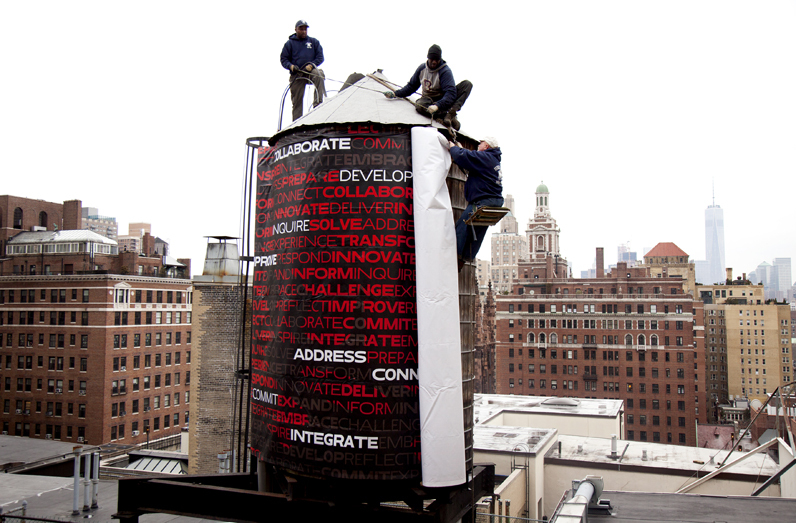 Crew members wrap the water tower on top of the building at 66 West Fifth Ave to reflect the university's new visual identity. Designed by Parsons Art Media and Technology students Rafael Cordoba and Joe Evans for their University Design Studio course. Photo by Kasia Broussalian/The New School. Students and faculty returning to campus after spring break may have noticed a few changes to our buildings’ exteriors: a splash of color, a unique new typeface, and a bold new logo. One could say the design was a year in the making, but in reality The New School has been redesigning itself—in both quiet and not-so-quiet ways—for the better part of the last decade. There have been curriculum changes at both Eugene Lang College and Parsons School of Design; new programs like Transdisciplinary Design, Journalism + Design, Media Management, and a BFA in Drama; and new partnerships with firms like Hearst and Durst and foundations like Carnegie Mellon and the Knight Foundation. And don’t forget our state-of-the-art sustainable new building at Fifth Avenue and 14th Street. Designed by Pentagram’s world-renowned graphic artist Paula Scher, the new visual identity was funded by the President’s Initiative Fund and generously underwritten by a grant from The New School’s Board of Trustees to improve the university’s recognition as a leading and unique institution of higher education. The New_S recently sat down with President David E. Van Zandt and Provost Tim Marshall to learn more about the reason for the new visual identity and the exciting new direction in which the university is heading. New_S: What’s the reasoning behind the new logo and visual identity? Why now? David Van Zandt: The new visual identity is a stage in the longer and frankly more important process of not only giving the university a more coherent and integrated focus that addresses what the world needs, but also communicating that to the world and to potential students in particular. Doing the former is essential, and no new visual identity or marketing succeeds if the substance it is communicating is not there. We took the university’s vision statement and distilled it into an outward-facing message and then tested it to be sure that it resonated with potential students and their parents all over the world. That was the first step. The second step was asking, “How do you best communicate that message?” In doing that, we gave serious thought to what the name “The New School” meant to the outside world. We wanted to gauge the strength of our name, both the words and visually. The goal is to have people see the logo or read the words “The New School” and think of our essence as a place for creative people who are looking to have a positive impact on the world. The visual identity is just one aspect of communicating what we stand for. Tim Marshall: You wouldn’t change things unless there was something that you needed to achieve that wasn’t possible with what you had. We needed a system that was flexible and dynamic enough to allow the various constituent parts of The New School to be promoted while keeping very simple and clear the relationship between the parts and the whole. New_S: So you had this external structure that didn’t really have a solid vision to animate it? TM: Yes! That was one part of the problem. Also, the design process is very important, and that’s why we brought in Pentagram and Paula Scher. They worked with an internal group that included faculty and board experts, to find a design that created a much simpler, more dynamic structure supported by and expressive of our mission and vision, with all these components easily connecting to The New School. That was really the goal, and I think we accomplished it. DVZ: It would have been impossible to do that if the substance of our core mission hadn’t changed. The work we’ve done since 2005, and definitely in the last four or five years, academically and institutionally, has resulted in a truly interdisciplinary educational experience. New_S: Let’s talk more about that transformative process. DVZ: Design schools historically and even into the 1990s didn’t have much of a reason to integrate into other schools. The same goes for liberal arts colleges. They just were what they were. But the world has changed, to the point that these underlying assumptions about education, which come largely from models of the 19th and 20th centuries, don’t meet the needs of the 21st century. The world demands people who are highly creative and innovative, who are flexible, and who can solve problems effectively. Design is only becoming more important as our economy relies more and more on creativity. And design is about how we organize objects, environments, and people to make the world a better place. At its heart, it is about human interface and how people behave and respond. Our strength in design and social research in particular gives this university an amazing opportunity to offer studies that are highly relevant to what the world needs today. We are uniquely placed in this respect: We are the only university in the world with a strong, comprehensive design school surrounded by excellent programs in the social sciences, humanities, and performing arts. We have an opportunity that no other university has. New_S: Here at The New School, we live that special magic every day. Can you see it from the outside looking in? DVZ: If you’re very creative, and you want to use that creativity to make a difference, then The New School is a great fit for you. Now of course, we still have a ways to go, but we need to ask ourselves constantly, “What’s good for our students? What’s going to make their lives and careers better?” In order to make those improvements, we always have to look outside and see where the world is heading. Fortunately, our university has a long history of this type of flexibility and willingness to challenge the status quo. New_S: We’re already seeing positive feedback from this new positioning and mission and vision. TM: There’s definitely proof in the pudding. Applications are up in our most distinctive programs. We’ve seen a lot of positive anecdotal evidence, too, especially with the new curriculum rollouts we’ve had at Lang and Parsons. The new curriculum that is rolling into its third year at Parsons is a major development for the whole university, as for the first time all the undergraduate design programs are completely embedded in the university. It has allowed us to develop a broad array of minors across design and the liberal and performing arts for all our undergraduate students. The new journalism program is an example where we have brought together previously separate areas of the liberal arts and design to create a journalism program for the 21st century. This is where the vision really matters—in the experience of the students and making their education as relevant to their lives and careers as possible. DVZ: The caliber of our students, alumni, and faculty is extraordinary. We’re seeing students who have advanced degrees in public health and other disciplines going into the MFA in Fashion Design and Society program and then creating work that comments on the political oppression of women in South America, and Parsons students working with Mannes students to re-envision attire for orchestral performance. These are just a couple of examples of how the vision is both reflecting and being reflected in our students and programs. TM: The students and faculty are actually leading a lot of the changes. They are the ones really pushing the school. Their future and careers depend on it. There’s a different character to the students here. They’re not drilled and programmed—they’re much more creative, eclectic, entrepreneurial, and intrepid. They’re capable of putting things together for themselves. TM: Failing, in the best sense! New_S: Getting back to the new visual identity, you had mentioned that a lot of research went into the new look. DVZ: That’s right. We took an iterative approach that is very similar to our pedagogical framework of design thinking: Identify an issue, research and understand it, create a prototype to address it, expose the prototype to the many stakeholders involved, and revise the prototype. We went through this process iteratively several times until we found something that really seemed to work. New_S: How is this new visual identity in keeping with our near-100-year legacy? New_S: So would you say we have the internal magic and we need the external structure to pull it all together? DVZ: We have to communicate that magic to the world. It is no good to have a great educational program if few are aware of it. TM: When you have a strong enough vision, you don’t have to force the semantics. This new visual identity really took shape in the right way: It started with a vision; then we went to market and looked at what resonated; and then we crafted that into a design solution.